Considering New York State’s long history in apple farming and cider production, one would expect to find many hard cider makers. This is not the case though, and those skilled hard cider makers are few and far between. However, within the Finger Lakes, one can visit Bellwether Hard Cider and taste some authentic ciders as well as their new collection of wines. 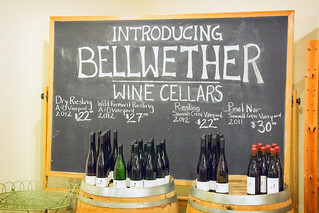 Bellwether began producing hard ciders back in 1999, and the current location in Trumansburg opened in 2003. It is an unassuming building along Route 96 that is surrounded by apple orchards. Inside, we were greeted by Amber at the tasting counter, as well as some friendly cats. We ran through a tasting of the following wines and ciders during our visit. Dry, austere, green apple and hints of wet stone. Fermented with only ambient yeast from the environment. Nice lively effervescence, good minerality. Fruity aromas, sweet but not cloyingly so. I taste honey and wet stone. Crisp, refreshing clean taste. Very tart. Similar to Lord Scudamore but a different blend of apples. More exposed to the tannins without the bubbly effervescence. Well made, very flavorful, we liked it a lot. Was also featured in Bon Appétit magazine. Apple flavors are much more predominant in this cider. Delicious. Good flavor, sweeter, more “apple-like”. Tastes just like an apple-cherry pie, with tart cherries on the finish. Excellent flavors. Very unique; you will either like it or hate it. The tartness from the currants battles with the sweetness of the apples. Recommended pairing with dark chocolate or cheese. We started with the wines as the sweetness of some ciders may have overpowered the delicate Riesling flavors. The winery, which opened in 2013, is run by the owner’s son-in-law, Kris Matthewson, who is also an assistant winemaker at Atwater Vineyards. Kris focuses on single-vineyard wines that are produced in very small batches. The Rieslings that we tried were all wonderfully made, showcasing the excellent minerality that the region is known for. Because they are produced in smaller quantities, the wines have a higher price point, starting at $22.00. Also, if you want to taste them, it will cost $1.00 per sample. For the casual wine drinker, you might want to pass; however fans of well-produced Rieslings should check them out. Unfortunately the Pinot Noir was sold out; not surprising considering only 95 cases were produced! The wine bottles all depict a male sheep, known as the Bellwether, who leads the other sheep in the flock. 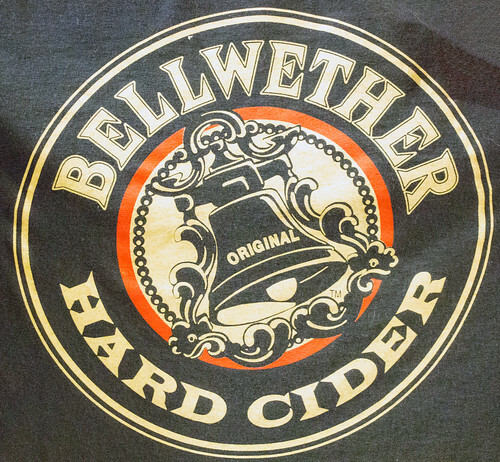 Switching over to the hard ciders we learned a bit of the history of Bellwether. Bill Barton and his wife Cheryl, co-owners, traveled all over France and were inspired by the cider regions. They brought this knowledge back to the States and opened Bellwether. Bill’s favorite hard cider is the Legacy, a traditional Brut made from English and French cider apples. I think a lot of people are probably surprised by the hard ciders because most are very dry and do not exhibit traditional apple cider sweetness. For $3.00 you are able to try five of Bellwether’s hard ciders. Bellwether’s apple orchard is filled with rare European varieties which are used in all the hard ciders. The more traditional American apple varieties are grown for them by local farmers off the estate. The most popular hard cider they produce is the Liberty Spy, a sweeter style hard cider. This doesn’t surprise me as it tastes most like an apple with good levels of sweetness that don’t bog down your palate. Most travelers to the wine trail seem to prefer the sweeter style. 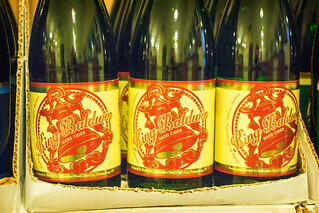 Around Thanksgiving time, the most popular to serve with the traditional turkey meal is the King Baldwin. 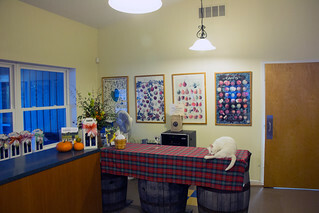 Don’t be surprised to see various cats and dogs hanging around the tasting room as Bellwether is animal friendly. 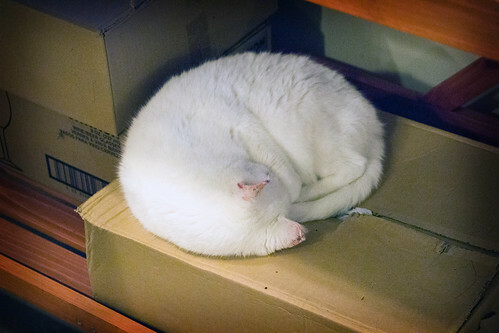 The cats actually live here and some of their tips and proceeds of sales are donated to local animal shelters. 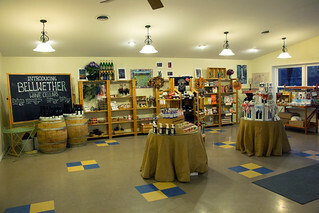 The tasting room also sells food, books, soaps, clothing, and more. There is a nice diversity of local products available that help showcase what the area has to offer. 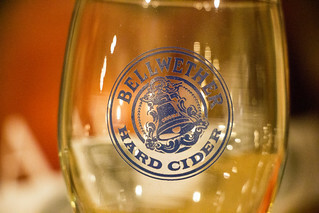 As a fan of hard cider, Bellwether is definitely worth a stop if you are traveling around Cayuga Lake. The staff is friendly and the variety of hard ciders is decent, with an emphasis on producing quality dry ciders. The wines are also worth trying as they really showcase the unique terroir of the region. Lord Scudamore was actually making bottle conditioned Ciders before Dom Perignon started doing the same with Champagne. Scudamore’s bottle conditioning was revolutionary, as all hard Ciders were stored in wooden barrels prior to this technique. It is said that the invention of thicker English bottles helped to make this possible and kept them from exploding during fermentation! This entry was posted in Cider Maker, Winery and tagged Cider Maker, New York, Winery by tanders1. Bookmark the permalink.